Becoming fit and healthy does not have to be complex. By engaging in low impact, repetitive and basic exercises, people are able to build, tone and increase muscular strength, stamina and coordination. According to the American Council on Exercise, "balance not only requires equilibrium, but also good stability of the core muscles and joints, particularly the hip, knee and ankle". Adding a balancing component to traditional exercises is an easy and fun way to enhance the effectiveness of those exercises. Designed to withstand the elements and year round use, the all-steel Balance Plank Station is finished in a durable powder-coat and topped with a marine grade plastic to create a safe, slip-resistant surface. It is a versatile accessory that is perfect for installation along fitness trails or as part of a larger outdoor fitness installation. 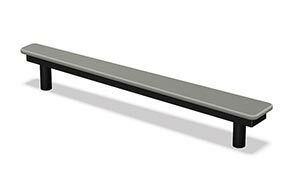 The Balance Plank Station provides a slip resistant 6-7/8" high platform that tapers from 6" to 3" in width. It can be used to test and improve balance by walking forwards and backwards from end to end or to practice jumps, dips, and yoga positions. The Balance Plank can also be used to aid in stretching, perform elevated push-ups or incorporated into a plyometric workout.